If you believe that enjoying the journey is as important as reaching the destination, the FIAT 500L Lounge was made for you. Designed for the ultimate in driver and passenger comfort and convenience, it makes a bold statement about your taste for the finer things like craftsmanship, style and luxury. It also shows off your generosity, with plenty of room for you and 4 friends. The distinguished, stylish exterior of the FIAT 500L Lounge makes every arrival a grand entrance. Standard chrome bodyside moulding, chrome exterior mirrors and fog lamps accent its graceful lines and confident stance. Your choice of body and roof colours, plus 3 available wheel styles, creates an impression anywhere. Inside the FIAT 500L, you’re treated to a rare blend of luxury, comfort and personality with an exhaustive list of creature comforts. Standard features include heated, leather-faced bucket seats with 4-way power lumbar adjust, leather-wrapped steering wheel and shift knob and dual-zone Automatic Temperature Control. The FIAT 500L Lounge comes with 17-inch painted aluminum wheels as standard equipment. Add a unique distinguished touch with optional machined aluminum wheels with your choice of black or white pockets. Make a bold personal statement by creating your own custom-designed FIAT 500L Lounge. Options include a roof in black, white or body colour, and many customization options to choose from. Also available is a 6.5-inch touch screen, as well as a studio-quality Beats AudioTM system with 8-inch subwoofer and 368-watt 8-channel amplifier. Under the hood of the FIAT 500L you’ll find the award-winning, technologically advanced 1.4 L MultiAir Turbo engine with 160 hp and 184 lb-ft of torque - the same engine that powers the FIAT 500 Abarth. This engine features twin intercoolers and an electronically-controlled hydraulic system to deliver outstanding performance and fuel economy. Paired with the MultiAir® Turbo engine is a responsive 6-speed manual transmission with advanced engineering that includes hill start assist. It offers the multiple benefits of exceptional fuel economy and precision control – for the kind of driving fun you expect from the FIAT family. The optional 6-speed Euro Twin Clutch automatic transmission gives you the best of both worlds with precise automatic driver-controlled shifting for fun and responsive performance. Eco:Drive is an ingenious way to improve how efficiently you drive. Transfer information about your driving style from your FIAT 500L to a computer with a USB drive or a smartphone via Bluetooth®. The eco:Drive app analyzes your driving style and gives you tips on how to use less fuel and reduce carbon dioxide emissions. The standard Park-Sense® Rear Park Assist System14 and ParkView® Rear Back-up Camera14 help make parking your FIAT 500L Lounge a breeze. ParkView provides a wide-angle view of the area behind the vehicle on the UconnectTM screen with dynamic gridlines to guide you, while Park-Sense alerts you with an audible warning when it detects an obstacle in your path. 7 standard air bags6 provide occupants with outstanding protection in the event of a crash. Plus, an advanced steel cage means 2 levels of safety and security for you and your passengers. Prevention is an important part of keeping you and your passengers safe. That’s why Electronic Stability Control7, All Speed Traction Control and Hill Start Assist are all standard on the FIAT 500L. There’s no substitute for cautious, attentive driving – and wherever you go, the advanced safety technology in the FIAT 500L is backing you every inch of the way. Every FIAT 500L comes with standard 4-wheel disc antilock brakes to help improve steering control and prevent wheel lockup in extreme braking situations. To help ensure your tires are performing optimally, the standard tire pressure monitoring system alerts you if any tire is losing pressure and is at the risk of being deflated. 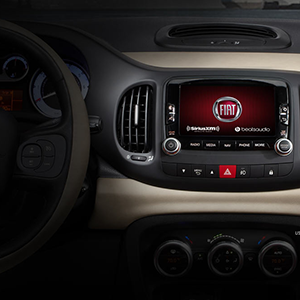 TAKE THE 2013 FIAT 500L LOUNGE FOR A SPIN! CheckboxWould you like to schedule a test drive?